Small enough to fit in a jacket pocket, Brooks-Range’s aptly-named Pocket Snow Density Gauge is an esoteric piece of avalanche equipment made to aid in the assessment of a slope’s snow quality, rate of snow metamorphosis, slab conditions, and snow-pack moisture content. 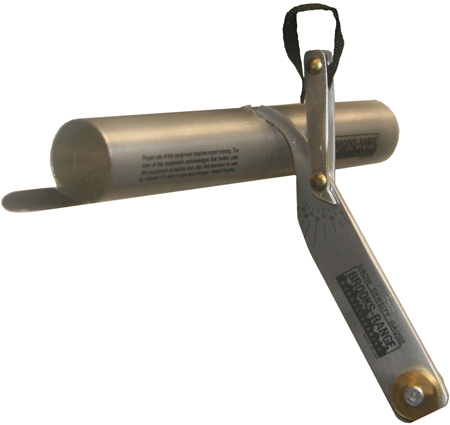 The gauge, made from aluminum, consists of a tube one inch in diameter and about seven inches long. It weighs 3.5 ounces. There’s a serrated cutter on one end to fill the tube with sample snow. By packing the tube with snow, the gauge determines snow density with a scale reading from zero to 60 percent (in one-percent increments). The gauge, modeled on a tool used by the National Weather Service, operates on the principal of mass balance.